Olympic Rings in Whistler, BC. That girl monkeyed her way up there like a pro. That’s right! 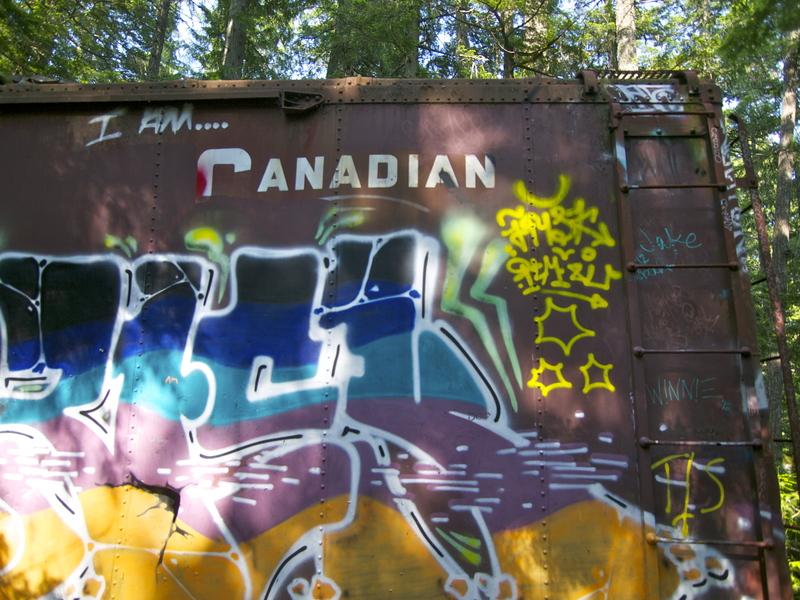 The Canucks let me, the Teardrop and the dogs into Canada! Just a few questions, no paperwork and no search. Man, I’m loving our northern neighbors already! 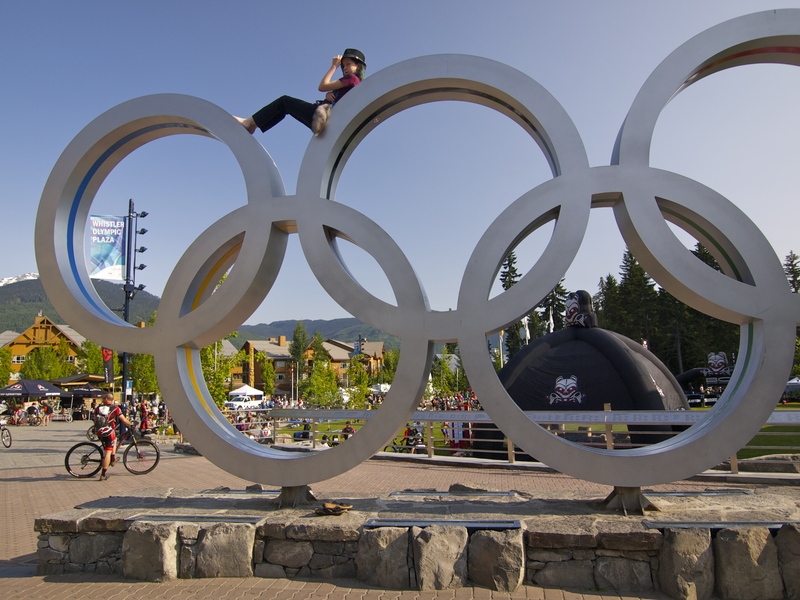 So how’s this for road trip serendipity: on Saturday I rolled into Whistler, British Columbia, – home of the 2010 Winter Olympics – about 15 minutes before the start of Canada’s biggest mountain bike race! 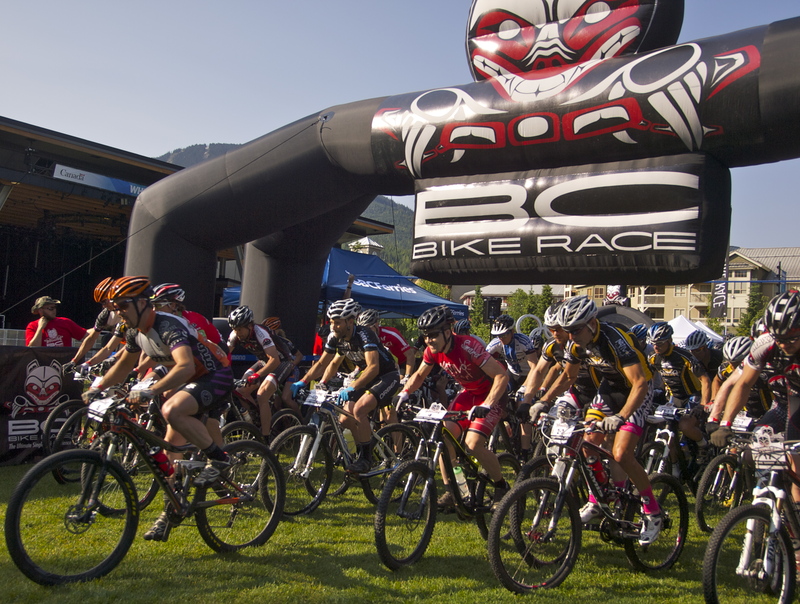 Several hundred spandexed professional mountain bikers, all revved up for the final stage of the 7-day BC Bike Race. I’ve never seen so much spandex in one place! Mountain biking is not my thing, in fact I don’t even own a bike, but I never pass on a chance to watch professional athletes do their thing. 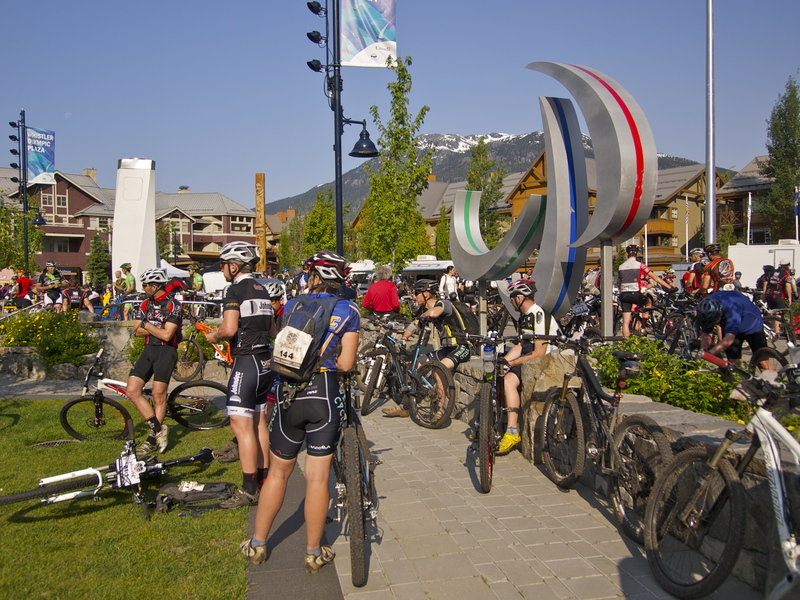 I stood right at the starting line in Olympic Plaza, where the closing ceremonies were held in 2010, as heats of 100 cyclists set off every 4 minutes for the mountain trails above Whistler. An hour and ten minutes later – an insane time split for 26K – they all came flying back into town, muddy and bloody and ready to party. What a riot! 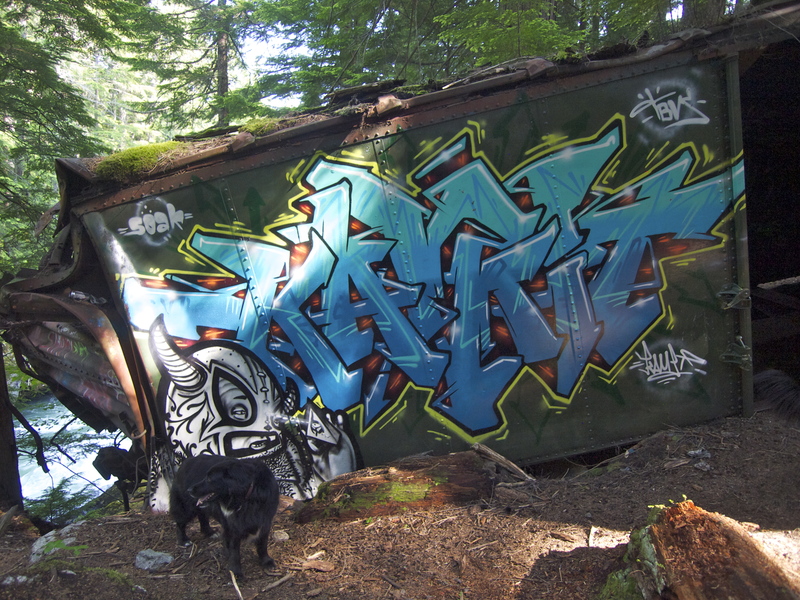 After walking all around Whistler, which doesn’t take very long, even if you do a few laps, I headed out of town with the dogs to check out a local legend: an old train wreck deep in the woods. 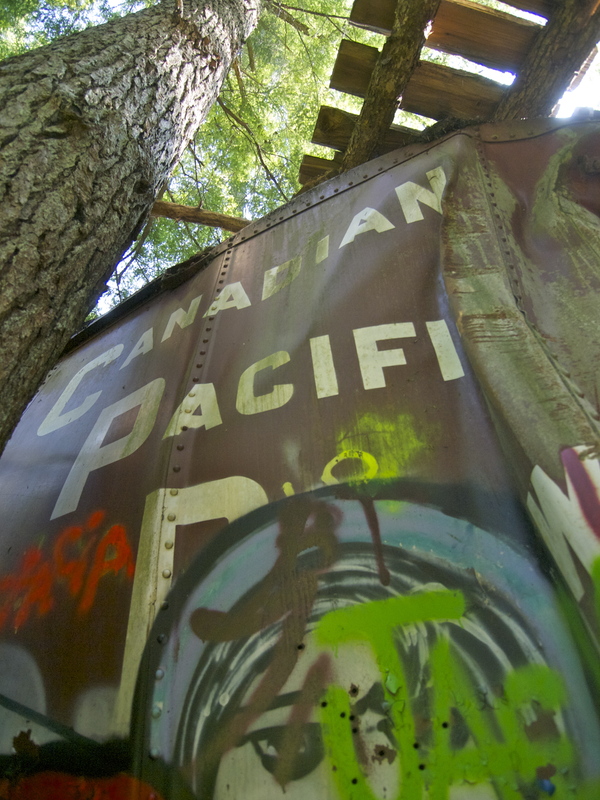 South of Whistler, a sharp turn in the Cheakamus River puts a sharp bend in the Canadian Pacific rail road tracks, too sharp, it seems for these seven train cars, which flew off into the woods and were never hauled back out. 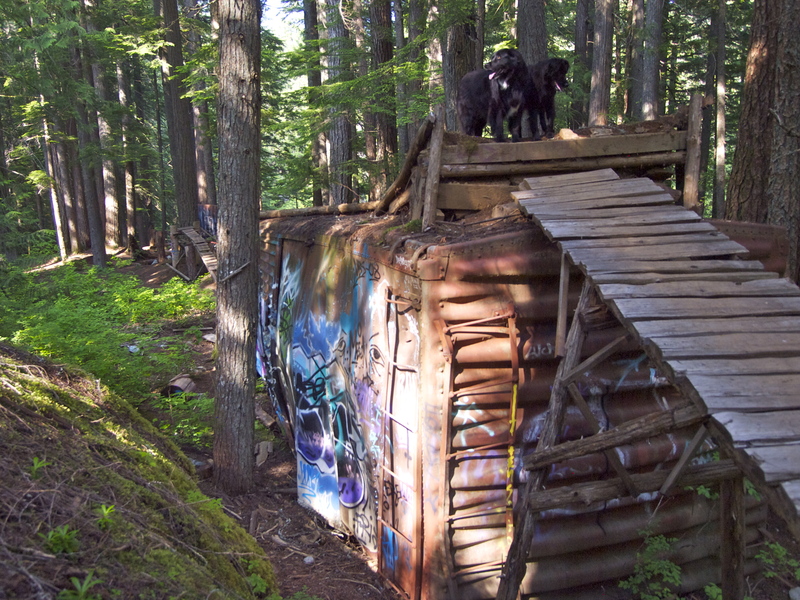 I haven’t been able to find a date for this wreck, but it’s on the order of decades old. 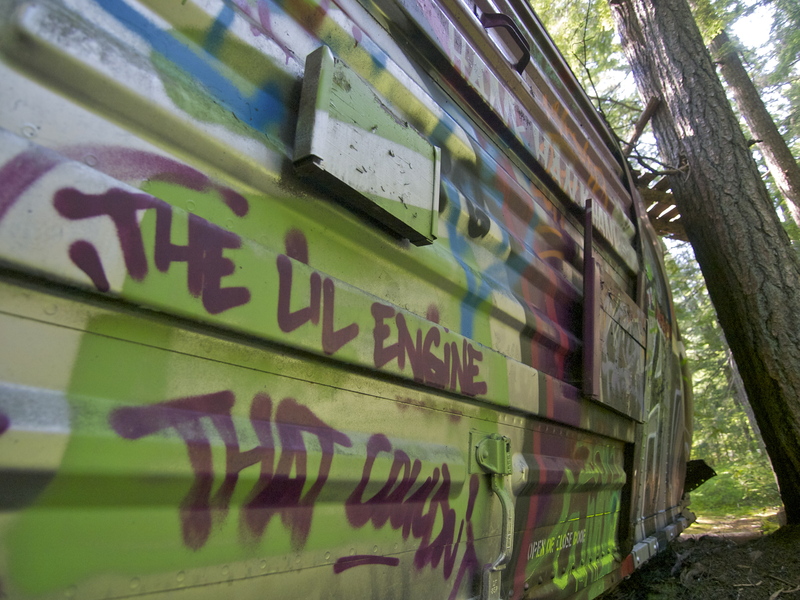 The cars have been reappropriated as a insane BMX bike course, complete with ramps and jumps on top of the cars, and covered in graffiti. 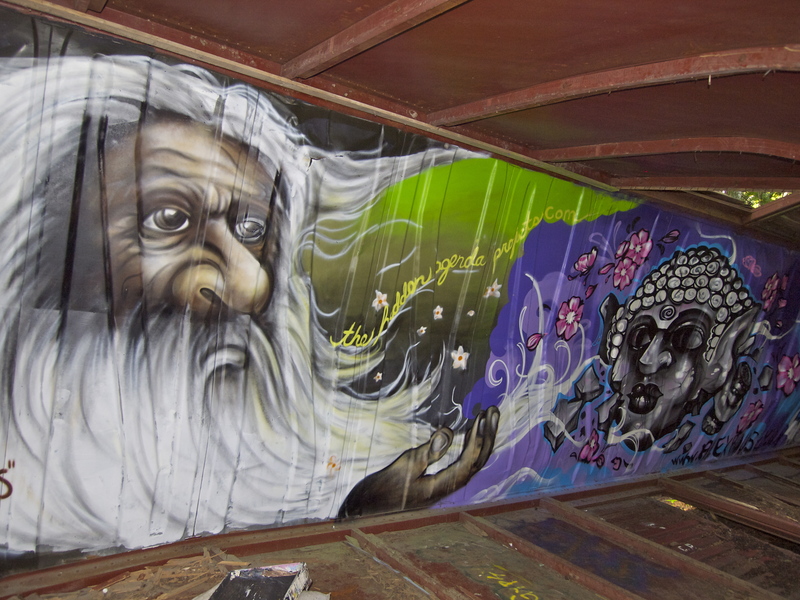 You guys know how much I love graffiti! 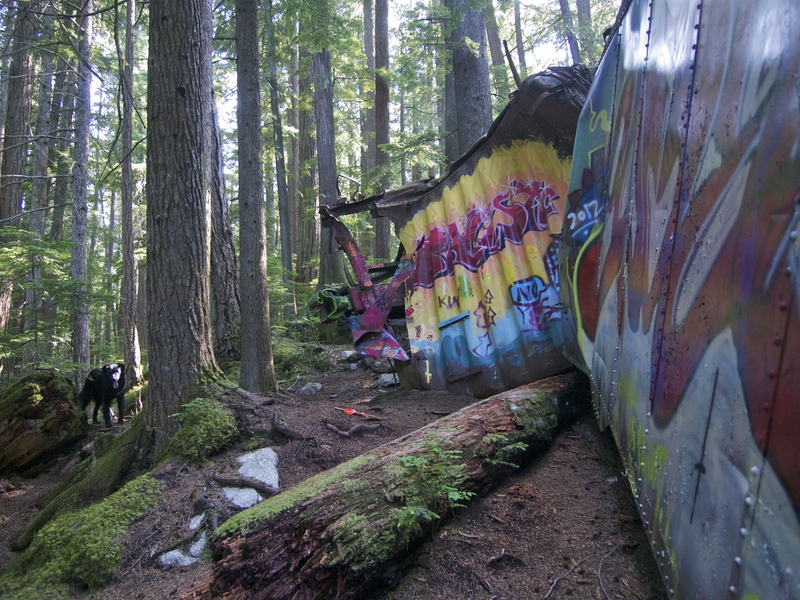 Wrecks, ruins, woods & graffiti, all in one place? This might be one of my all time favorite road trip treasures! 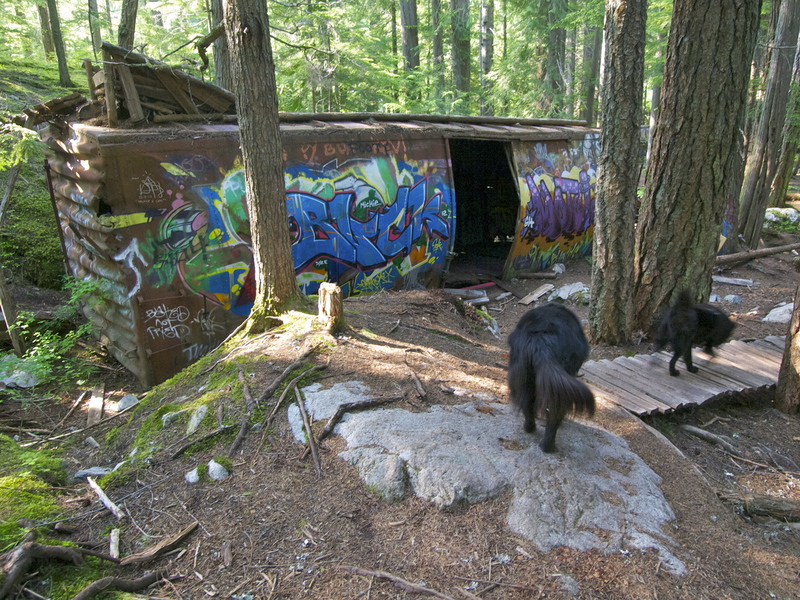 This entry was posted in Beyond the USA, Bowie & D.O.G., Hiking!, Photography, Road tripping!, Uncategorized. Bookmark the permalink. Love the Little Engine that Couldn’t. Now I want to go read all the Boxcar Children books. Welcome to Canada! The West Coast is stunning, the Yukon is unforgettable, but if you ever make it to the East Coast of this fine country, be sure to visit Newfoundland! Especially Gros Morne National Park. Great pictures! I have yet to check out the train wreck. 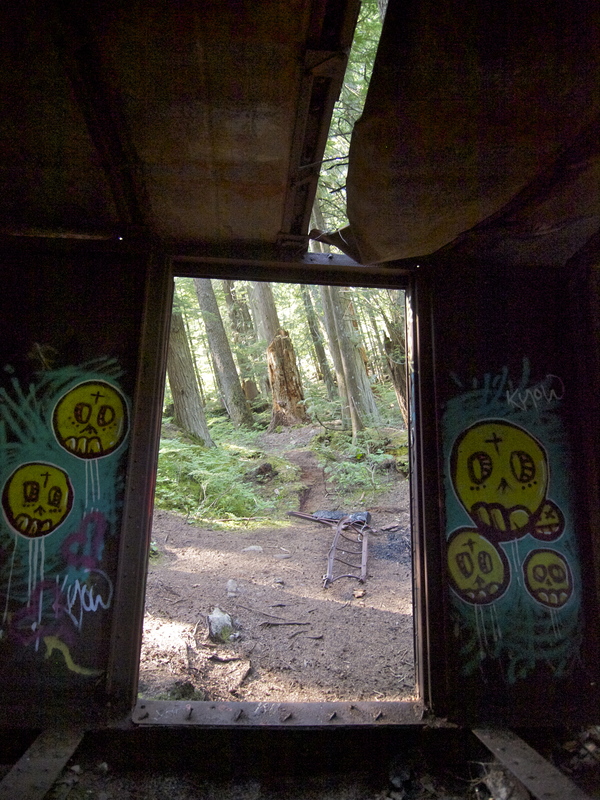 Enjoy BC it is a beautiful place! Great pics! I’ll be up there in a month – woo hoo!